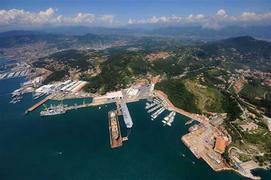 In what easily ranks as the biggest new construction order since the start of the financial crisis last year, Alex Lees-Buckley at Camper & Nicholsons in Monaco has signed a 140m new build motor yacht, yard number 6218, with Italy's Fincantieri Yachts. To be built to an Espen Oeino design over seven decks, designers Alberto Pinto and Laura Sessa have been commissioned to style the interiors. Further details remain sketchy at present but as soon as we know more, we'll let you know.